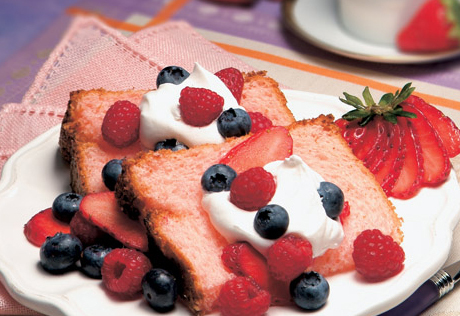 What a great idea...make a box mix angel food cake using berry blend juice drink instead of water. Topped with fresh berries and whipped cream, it's so easy, and so delicious. Heat the oven to 350°F. Prepare the cake mix according to the package directions, substituting the juice drink for the water. Pour the batter into a 10-inch tube pan. Bake for 40 minutes or until the top is golden brown and springs back when lightly touched with a finger. The cracks in the top of the cake should look dry. Invert the cake in the pan and hang upside down on a funnel or heatproof glass bottle for about 1 1/2 hours to cool completely. Loosen the cake from the pan with a metal spatula. Cut the cake into 24 slices. For each serving, place 1 cake slice on a serving plate, top with 1/4 cup berries and 1 tablespoon whipped topping, top with another cake slice, 1/4 cup berries and 1 tablespoon whipped topping. Repeat with remaining cake slices, berries and whipped topping.